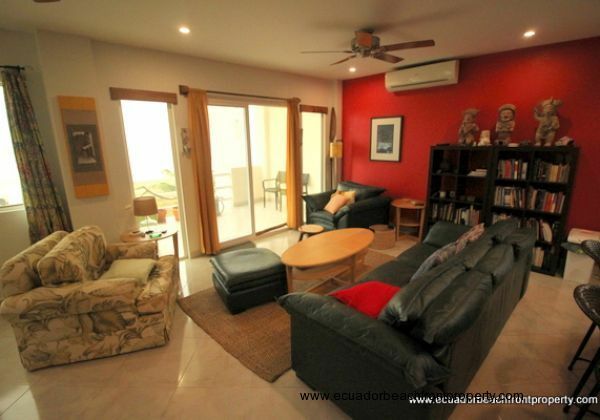 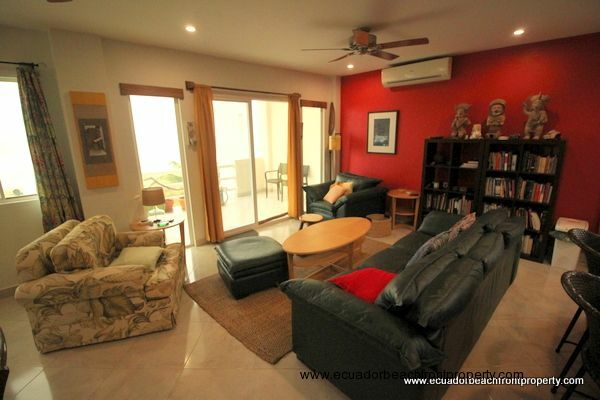 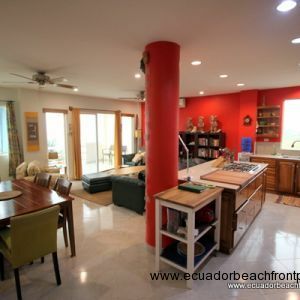 This 3 bed/3 bath Beachfront Penthouse provides a private island on the top floor of the center building in the Playa Azul Condominum Complex. 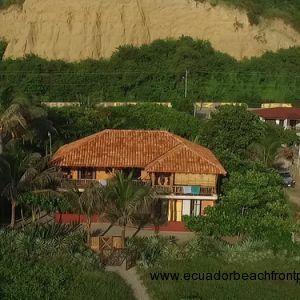 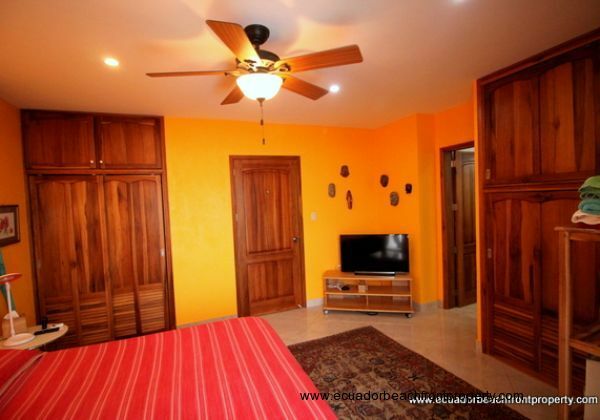 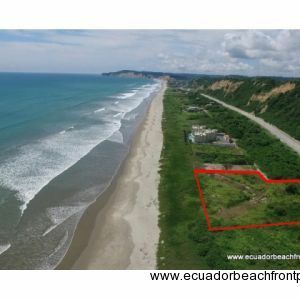 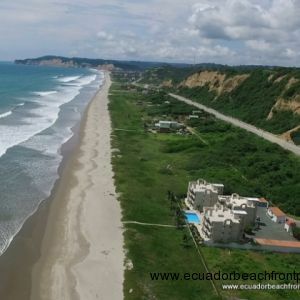 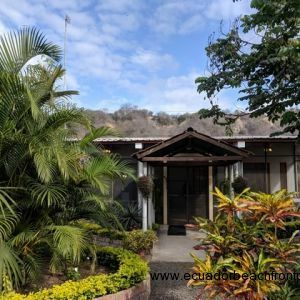 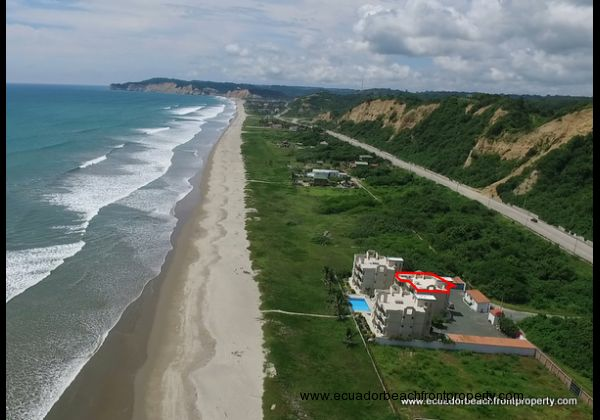 Located along a peaceful stretch of Canoa's 7 kilometers of beaches, the new owners will be just steps away from an uncrowded beach break excellent for surfing/board sports. 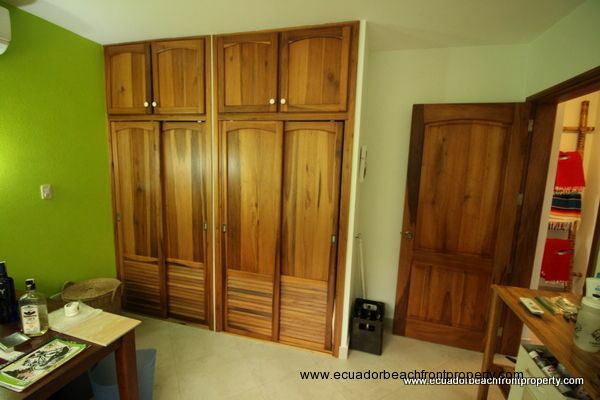 The penthouse comes complete with custom furnishings and cabinetry made by local artisans using indigenous woods. Porcelain tile floors keep the space cool and accent the rich wooden doors and ample cabinetry. 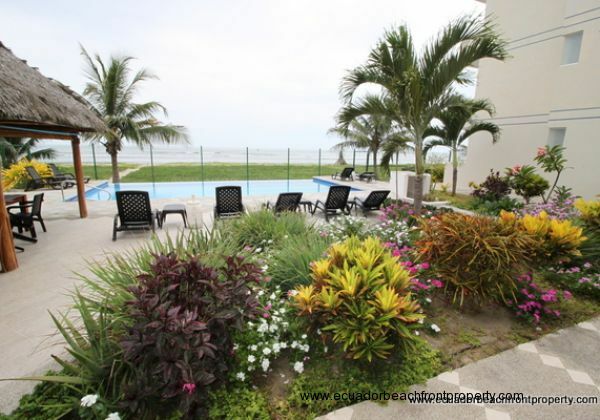 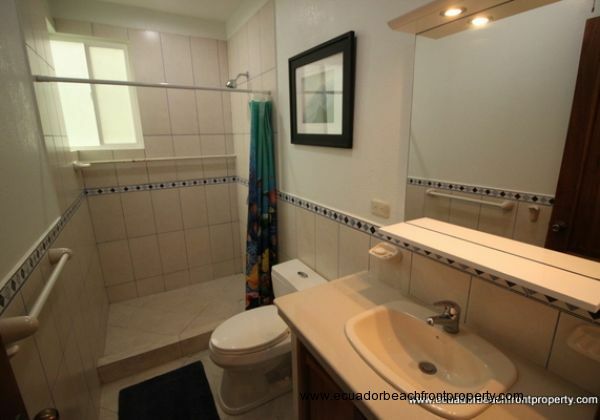 Whether full-time residence, tropical getaway or rental property this well-cared for condo is easy living at its best. Within the 1620 square feet of this penthouse condo, the spacious great room is definitely a highlight. 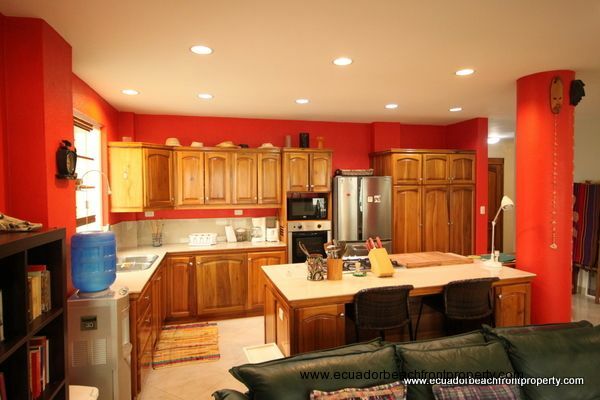 The gourmet kitchen, dining and living room areas all offer ample views to the Pacific Ocean. 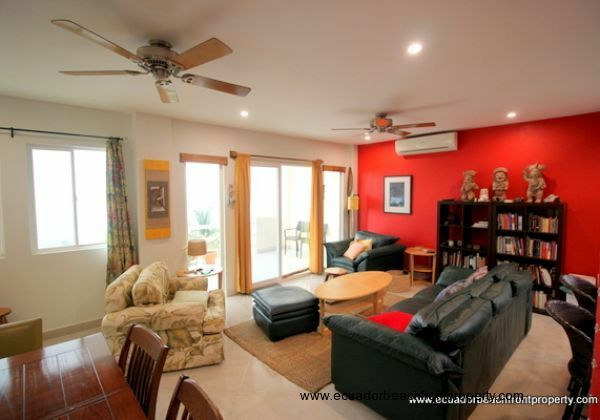 The cross breeze in the penthouse is simply a blessing and helps to keep the space fresh and cool even when the sun is out. 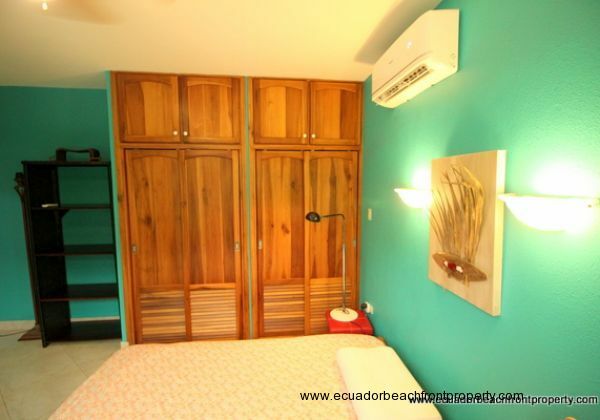 When you want to cool things off even more, a total of 4 split A/C units are also installed throughout the living spaces and bedrooms so you can optimize energy use and cool the spaces that you are using. 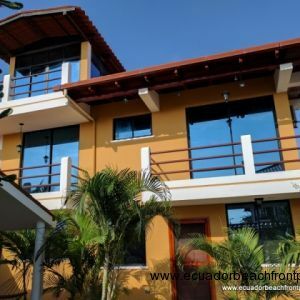 All window frames and the sliding glass door frames are made of PVC and are especially durable when living in close proximity to the ocean. 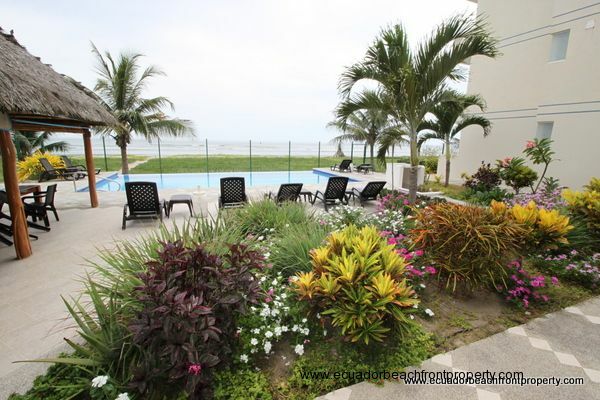 The sliding glass doors in the living room lead out to a private covered balcony with views to the Pacific and down to the infinity pool and common barbecue and group dining area. 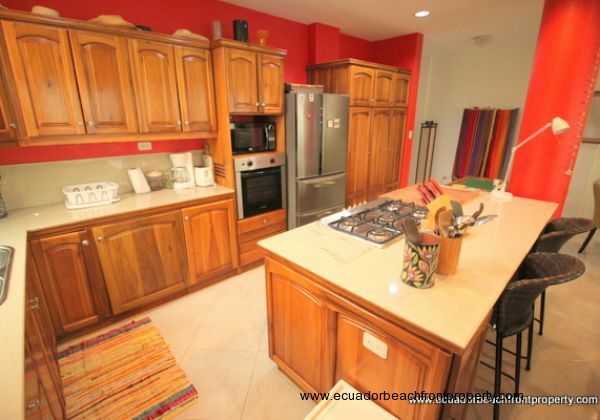 The exhibition kitchen is perfect for entertaining and sharing the cooking and food prep with family and friends. 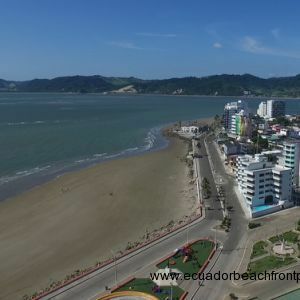 All types of seafood are plentiful and readily available at local markets or through the relationships you build with local fishermen and seafood distributors. 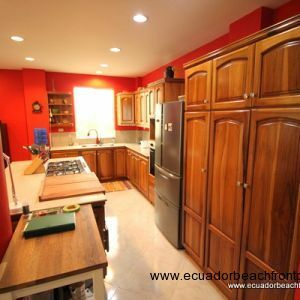 Fresh breads, including European styles, are baked locally and can be delivered on call. 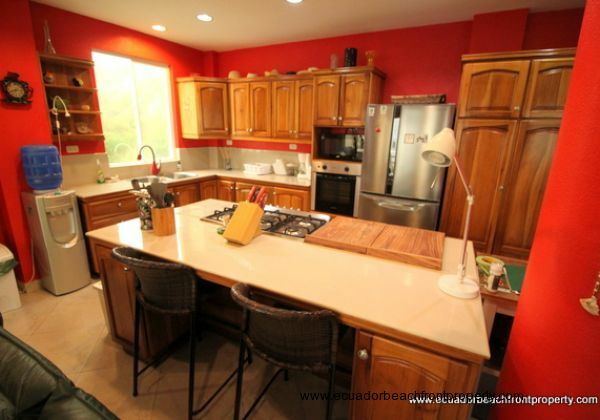 The custom wood cabinets and pantry provide ample storage and the clean Corian countertops provide plenty of room for sharing the food prep and for keeping your kitchen gadgets at arms reach. 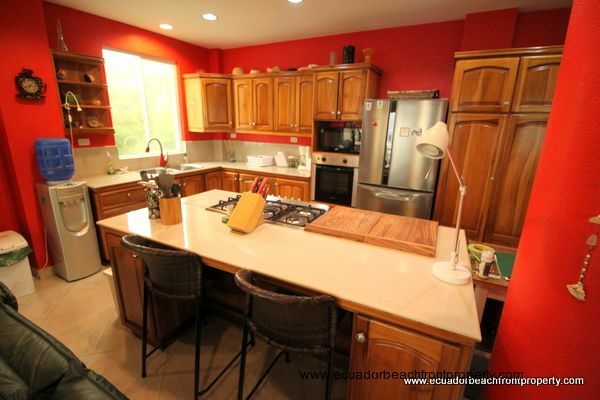 Outlets are conveniently located throughout the kitchen and cooktop island. 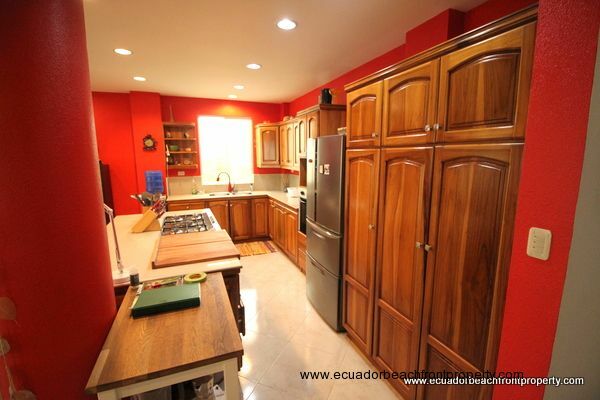 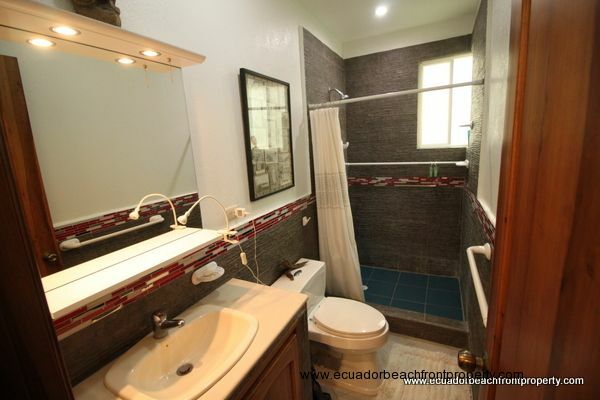 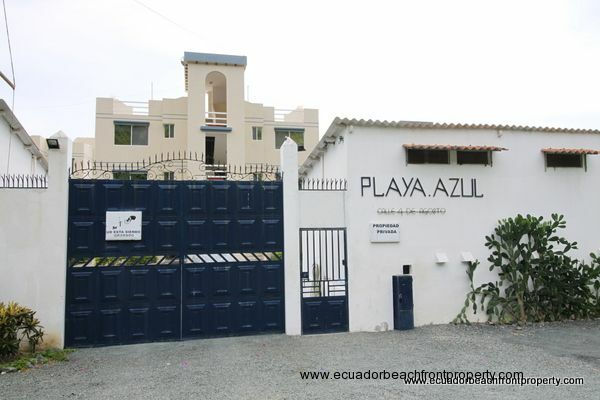 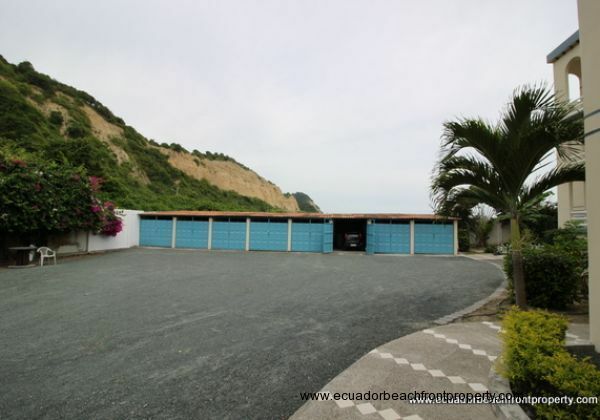 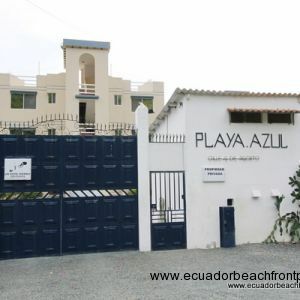 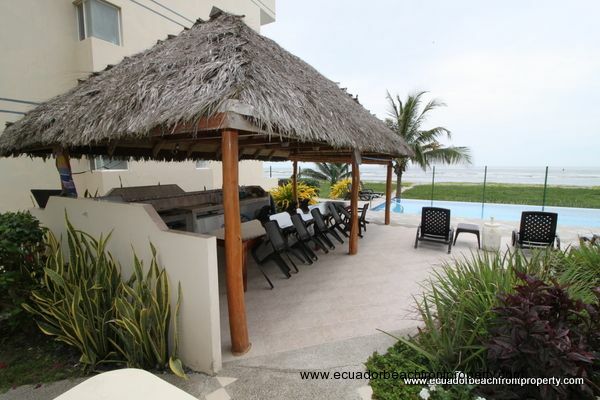 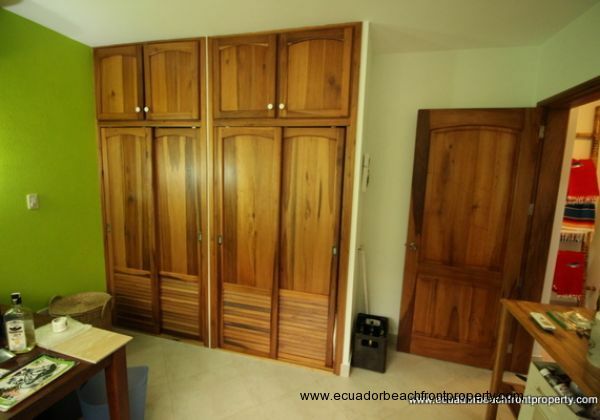 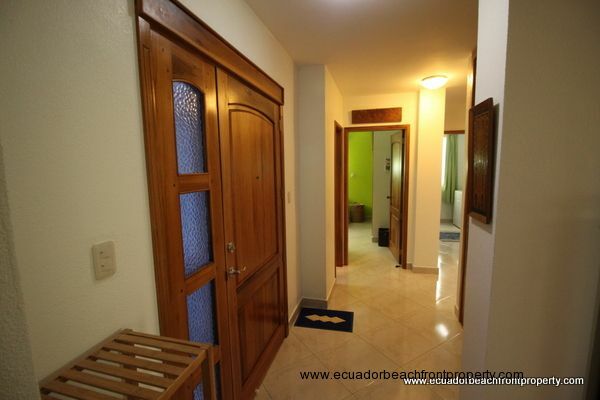 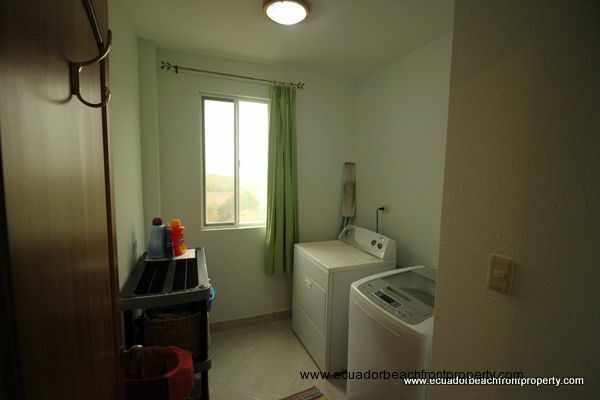 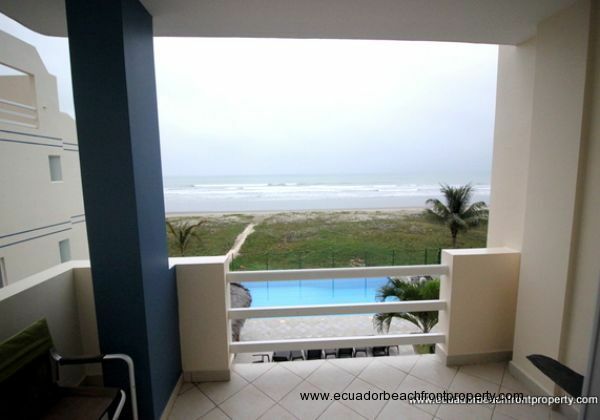 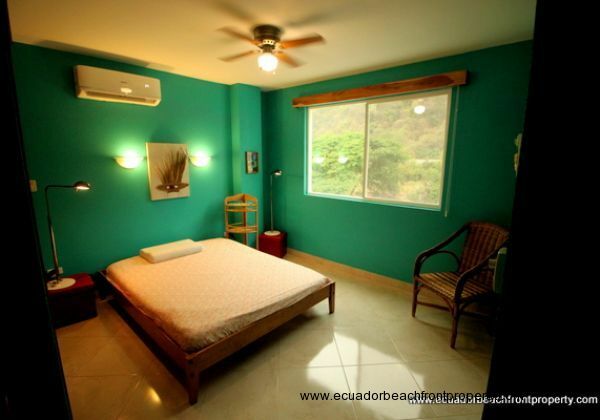 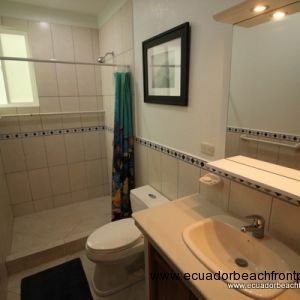 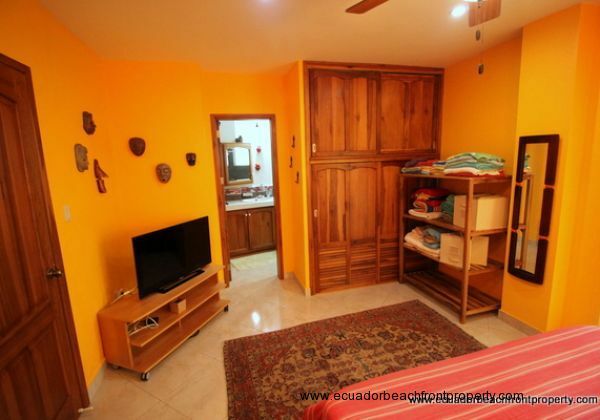 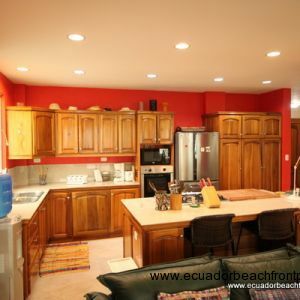 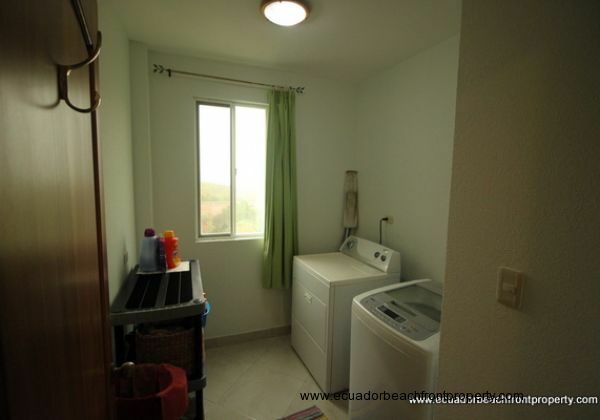 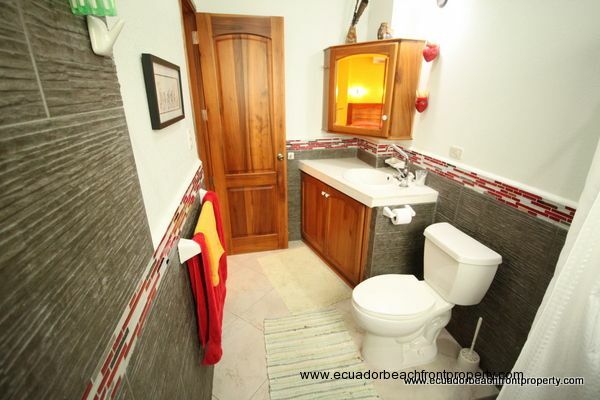 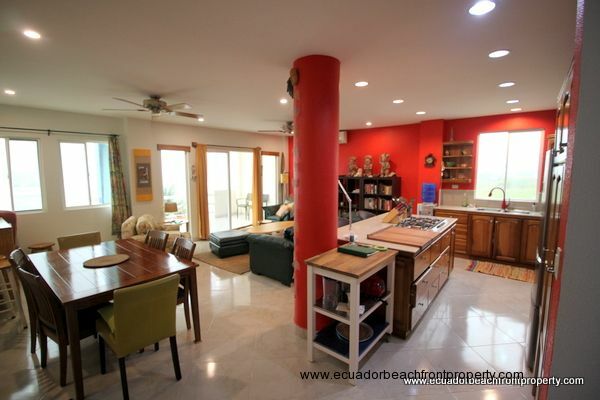 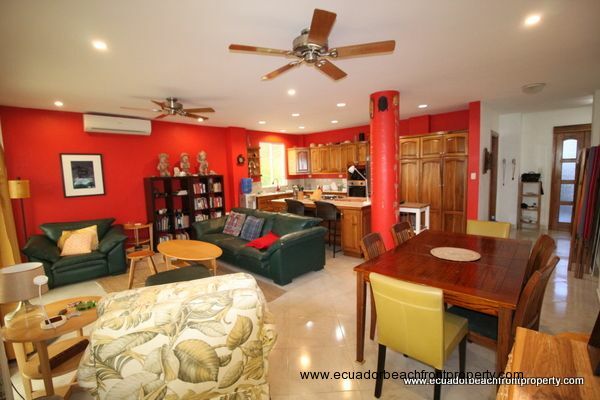 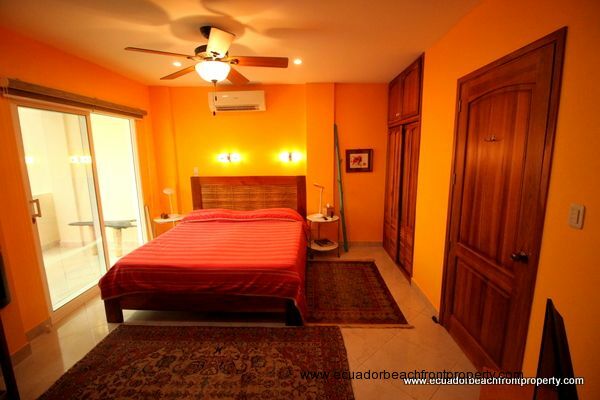 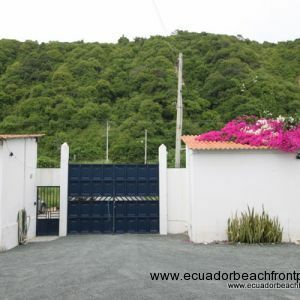 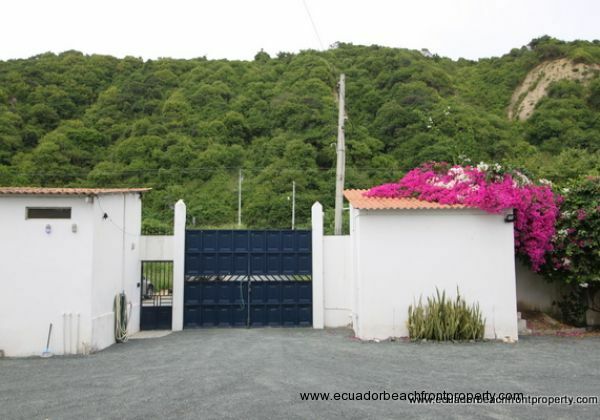 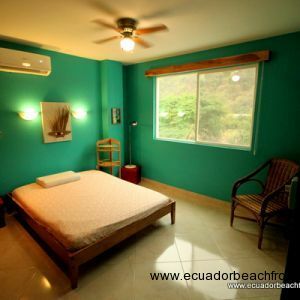 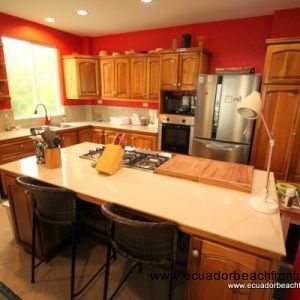 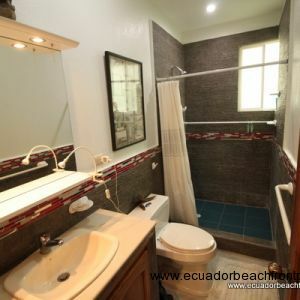 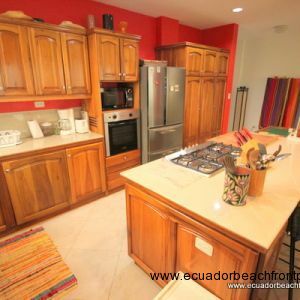 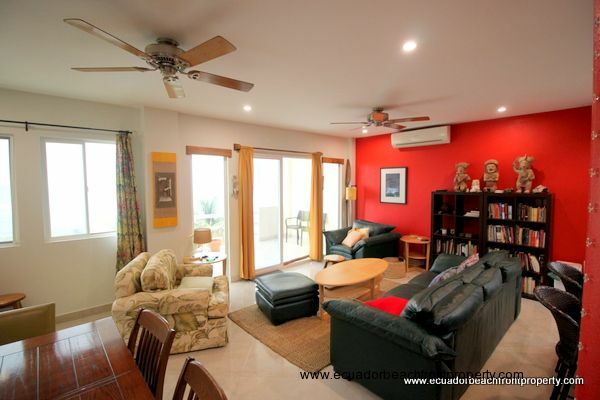 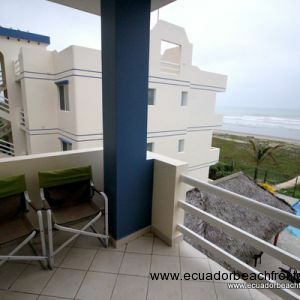 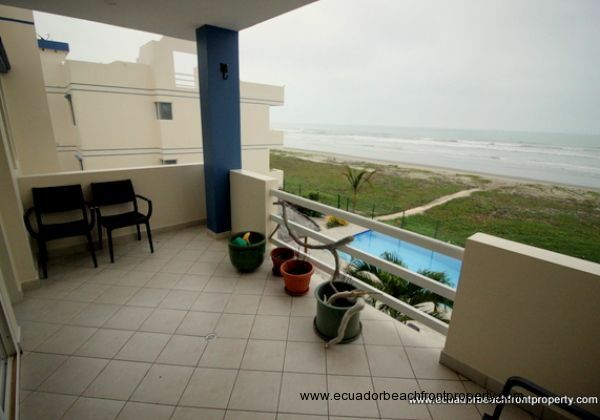 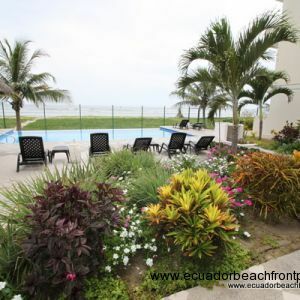 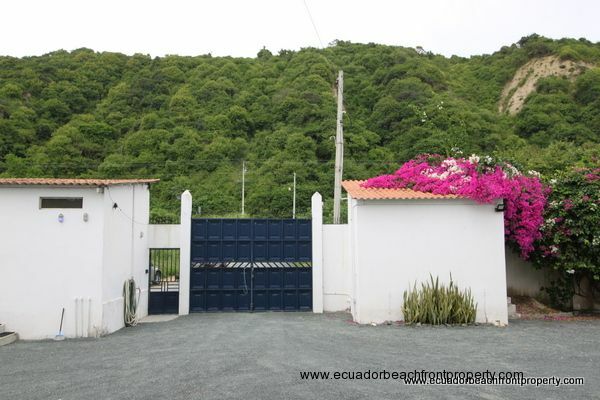 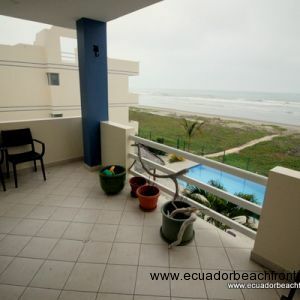 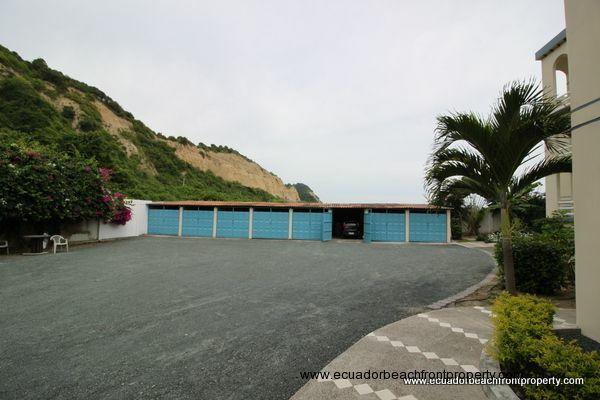 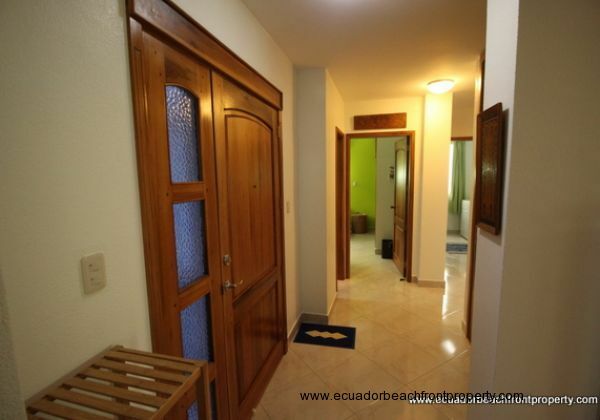 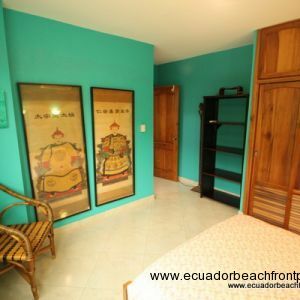 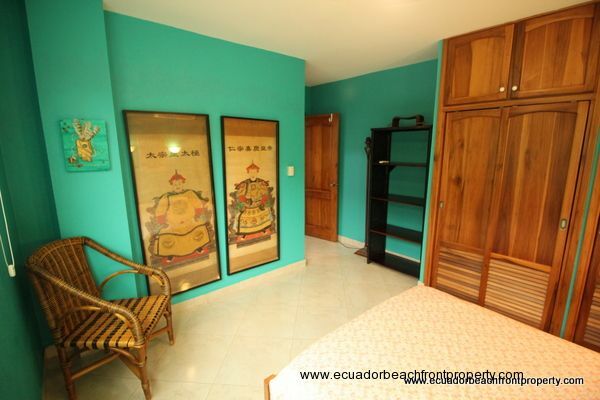 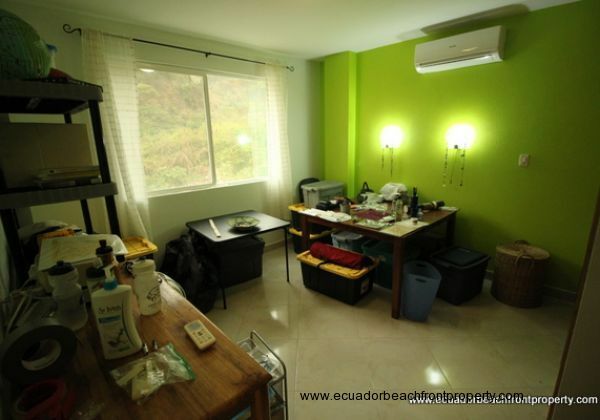 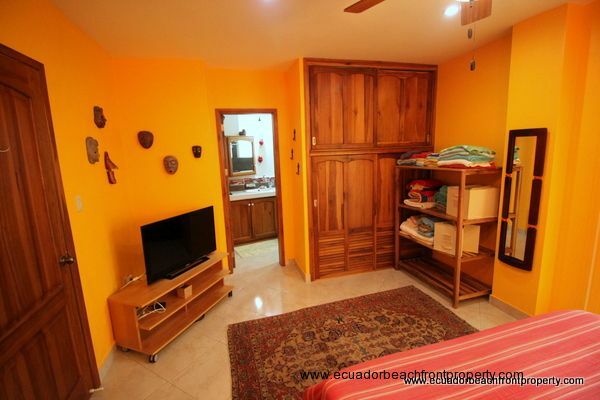 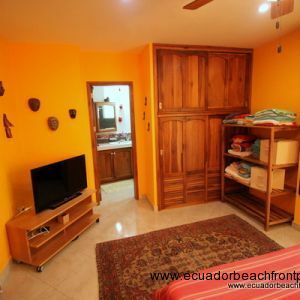 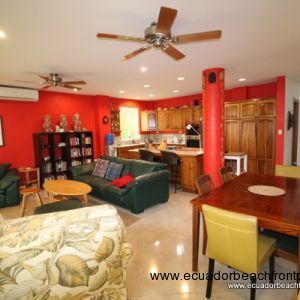 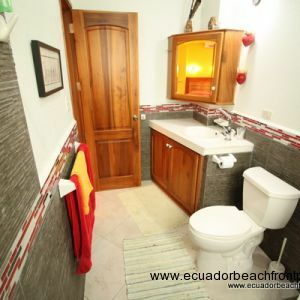 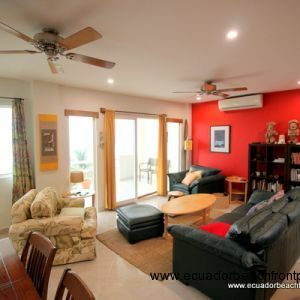 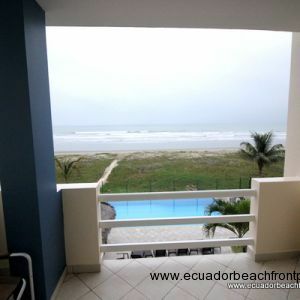 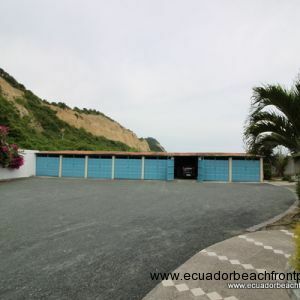 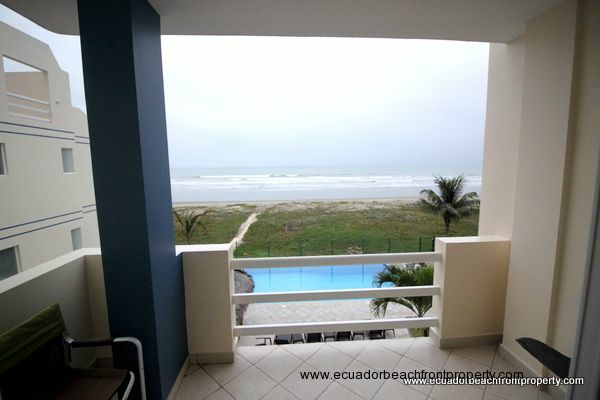 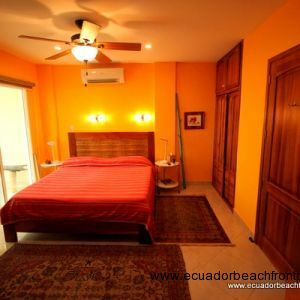 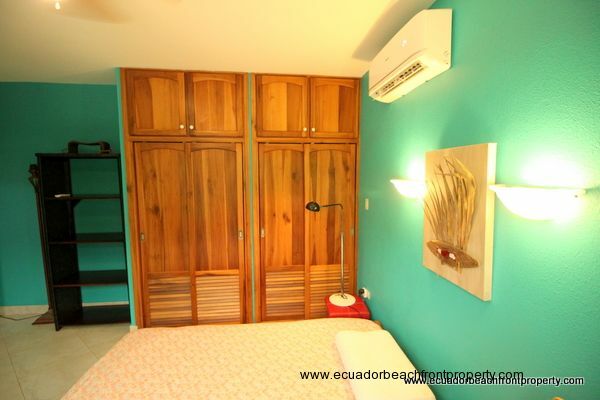 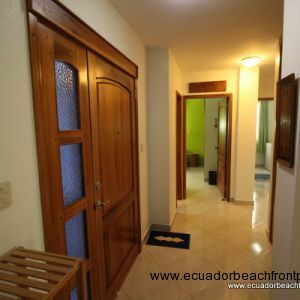 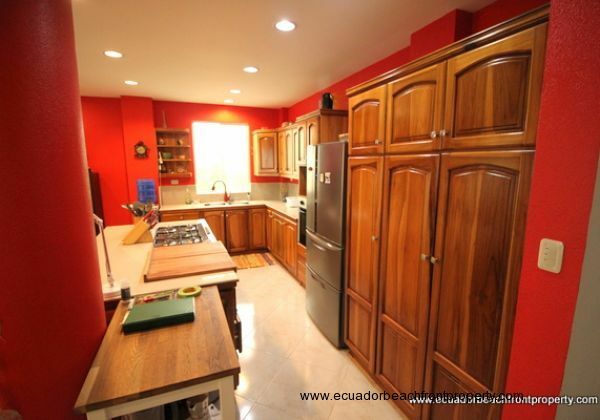 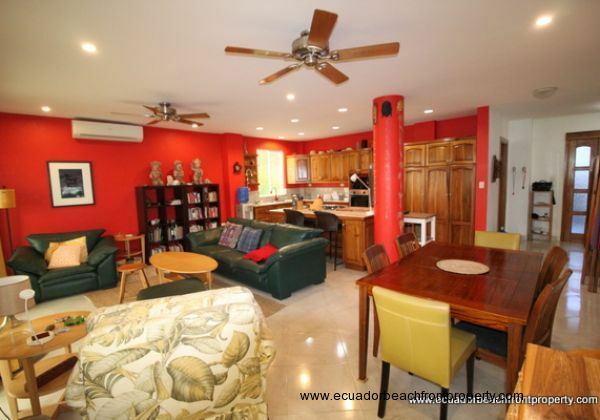 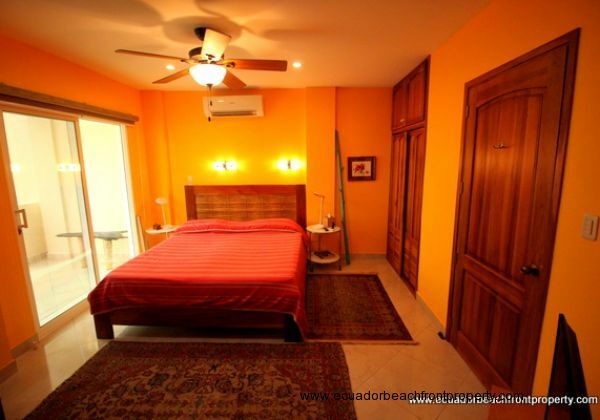 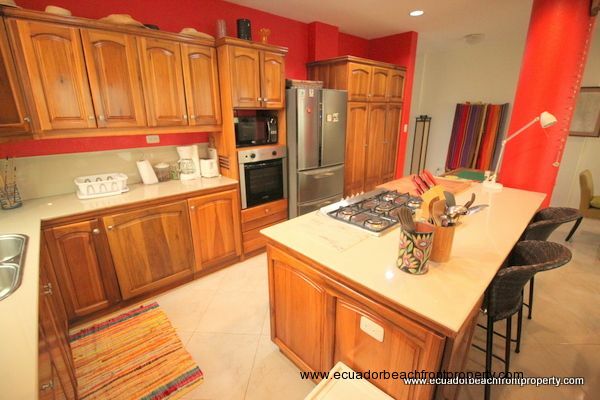 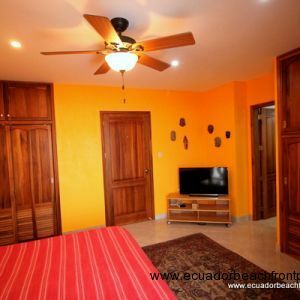 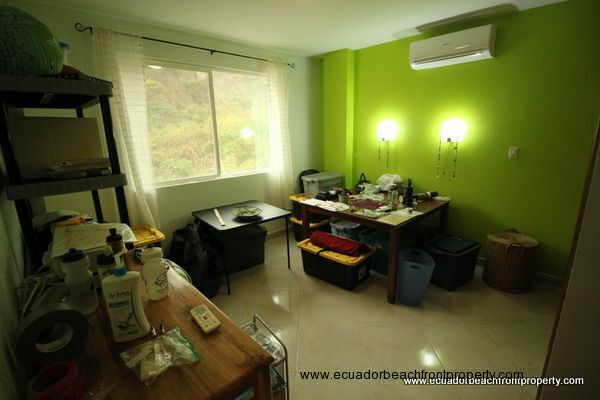 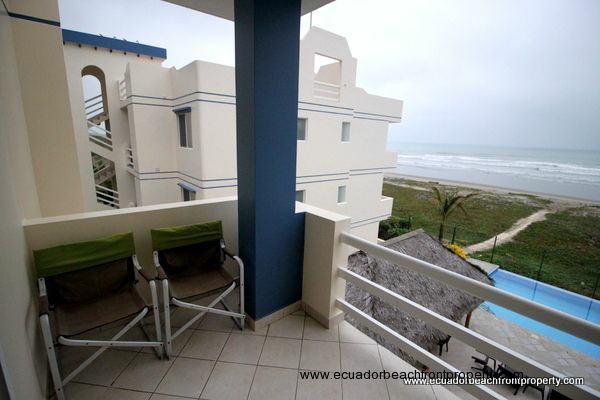 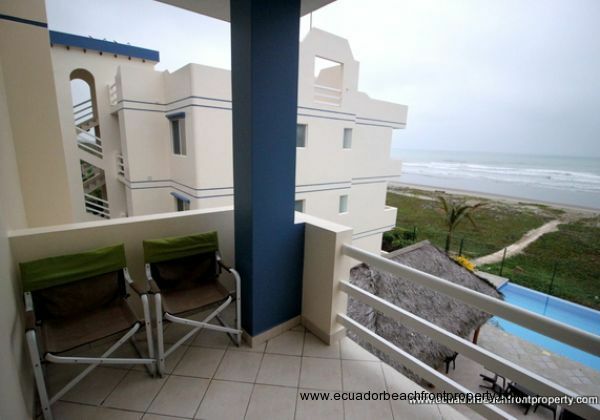 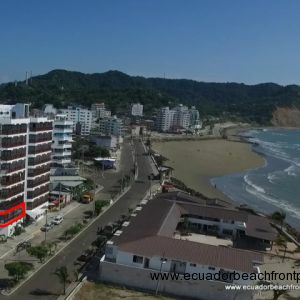 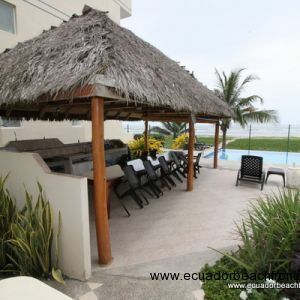 The built-in oven, double basin stainless-steel sink, stainless refrigerator with double freezer drawers, built in microwave, and 5 burner gas stove are welcome perks seldom found in beachfront condos in Ecuador. 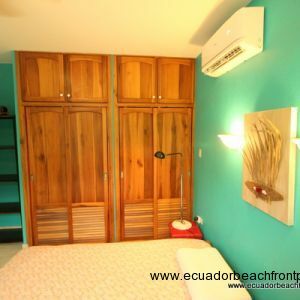 The master bedroom with king size bed is wide and spacious and features plenty of custom wood cabinetry and its own private covered balcony with Pacific Ocean views. 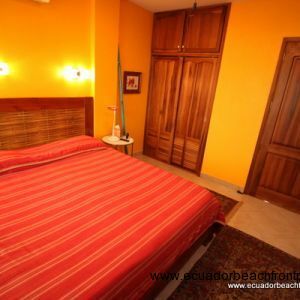 The balcony and the bedroom provide great spots to escape and take in a book or catch up on communication with family and friends. Please see the slideshow at the top of the listing for more photos including the master bedroom TV, dresser, additional closet space, the elegantly finished master bathroom and views from the balcony. 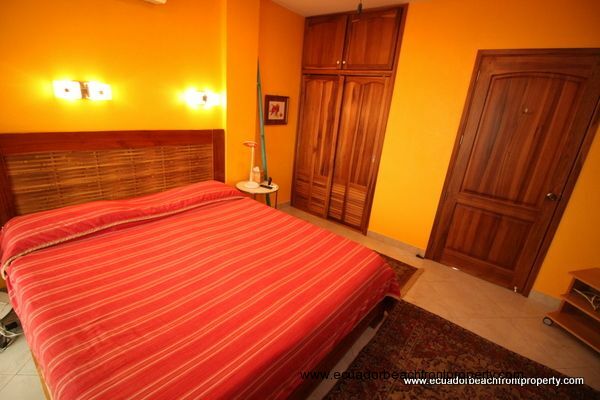 The second bedroom is beautifully appointed with a queen size bed and ready to receive your visitors. 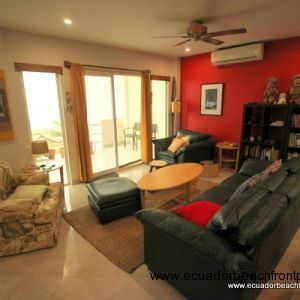 The window opens to the courtyard and has beautiful morning light and views to the hills that rise to the east of the condo building. 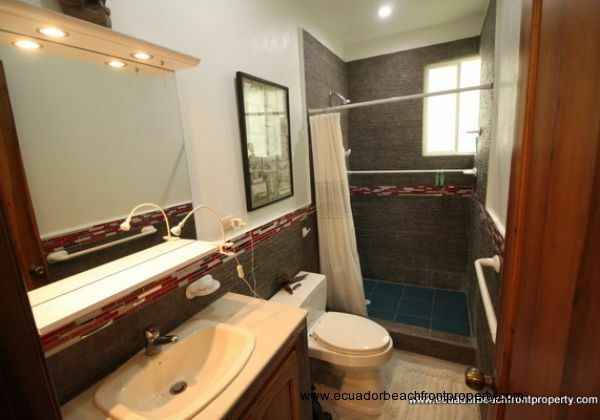 The same attention to detail found in the great room and master are found in the guest suite including a large custom built wooden cabinet, custom lighting, and en-suite bath. 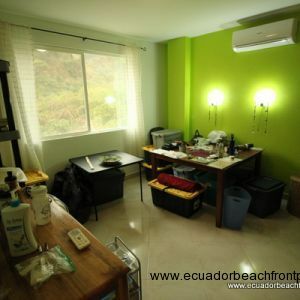 The third bedroom is currently used as a small office and workshop space but can easily be furnished if a third bedroom is desired. 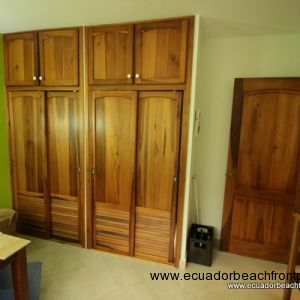 All AC hookups and cabinetry is already installed and ready. 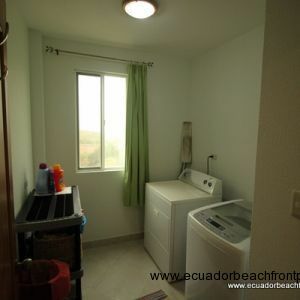 Please see the slideshow at the top of the page for more photos including the laundry room and the included full size washer and dryer that conveys with the sale. 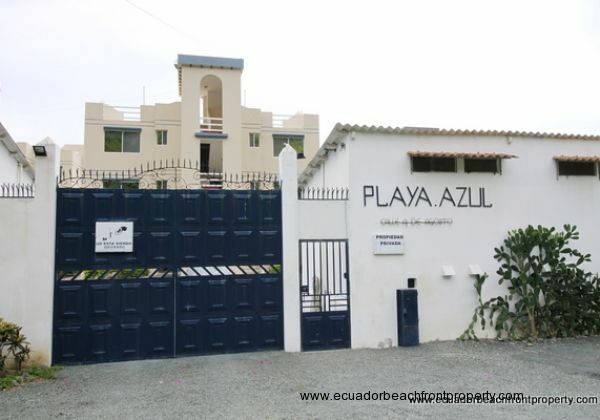 Finally, the common areas of the Playa Azul condo project include an infinity pool, water filtration system, outdoor grill area, private garage parking and storage areas (One is included with this unit), and tropical gardens. 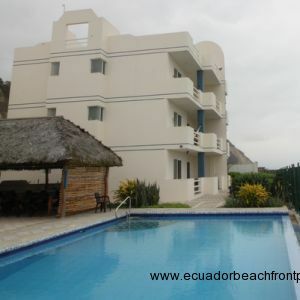 Security cameras are installed onsite and the $175/month HOA covers groundskeeping, pool maintenance, and security. 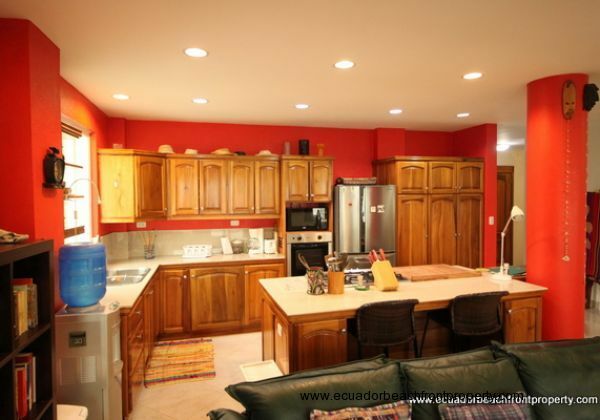 Please contact us with any questions about this property or to schedule a showing.